4 weeks ago I was gifted Shaffali Skincare and little did I know my beauty regime was about to change forever. Flash Back to May when I met the beautiful Shaffali herself at a Beauty event in Dallas, Texas. I knew immediately after meeting Shaffali and hearing about her amazing products that I needed to try them. If you know me, and have been following me for a while, I am a firm believer in trying everything for at least 3 -4 weeks prior to blogging about them. 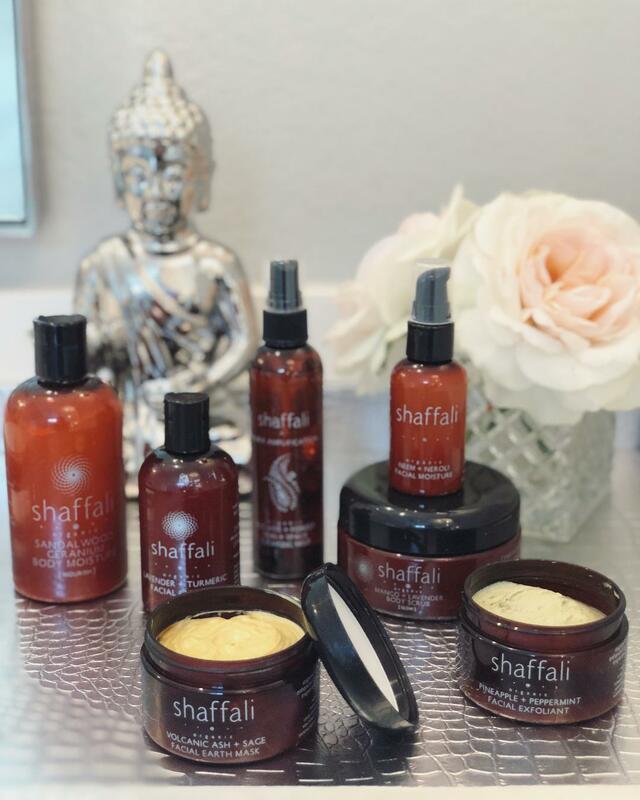 Shaffali Skincare is inspired by Ayurveda and enhanced with aromatherapy. 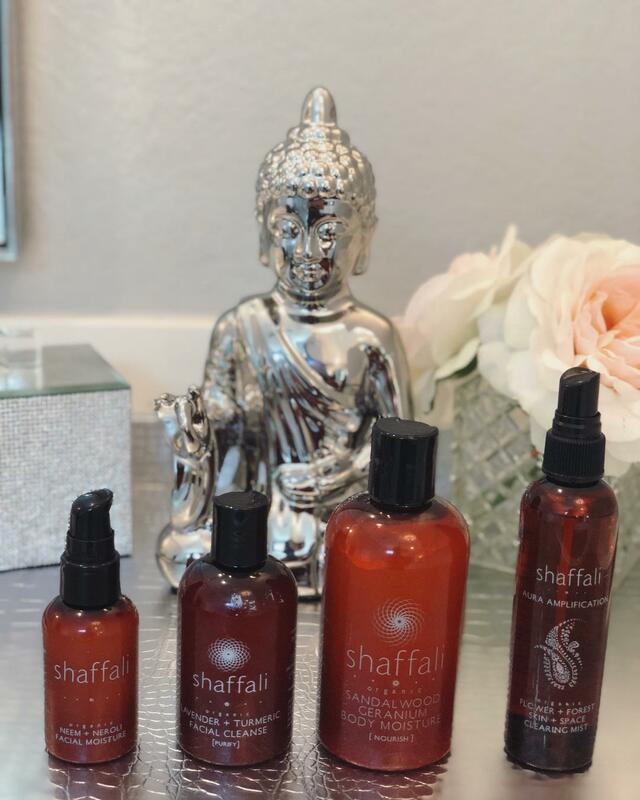 The Shaffali line is PH balanced for face and body, non-toxic, vegan, no synthetic fragrances, articificial colors , sulfates, parabens or phthalates. How amazing is that yall! 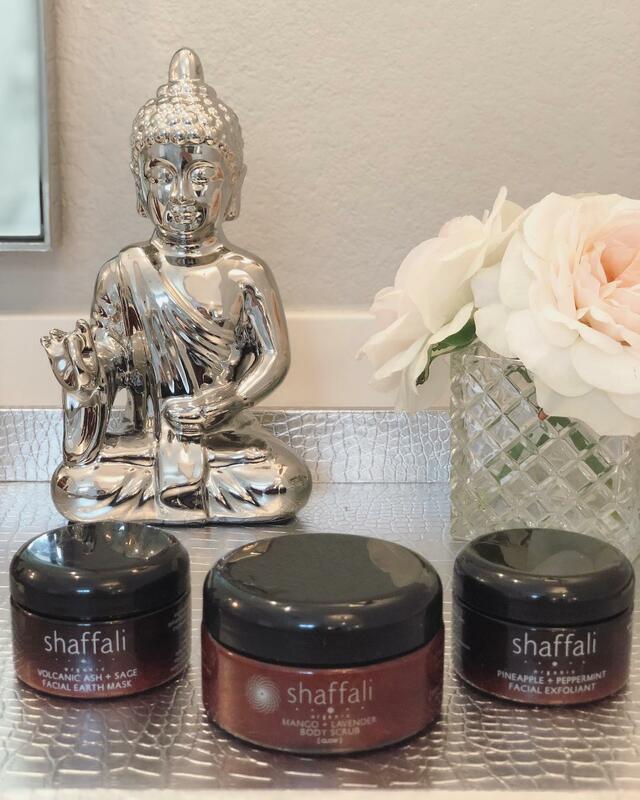 Shaffali believes meditative visualizations with each product create a deep care for your skin and spirit that will amplify your inner and outer glow. Let’s take a look at the products I have been using these past 4 weeks. First up is the Neem and Neroli Facial Moisturizer. This beautiful moisturizer smells so delicious and has left my skin feeling extremely hydrated and leaving my skin so very soft. I really love it and look forward to applying it because I know my skin is about to get a thirst quenching treat! Next up I used the Pineapple and Peppermint Facial Exfoliant every night after washing my face with the Shaffli Organic Lavender and Turmeric Facial Cleanse . The smell of this exfoliant is so intoxicating and left my skin glowing! I loved it so much I decided to switch it up and started using the Exfoliant during the day and only putting on mascara, sunblock and lipstick. That’s how good this product is. Next, I used the Volcanic Ash and Sage Facial Mask on Fridays and Sundays. This mask is a game changer. Volcanic ash- Detoxifies the skin. Sage- Anti-aging essential oil (you had me at anti aging). Turmeric- Anti-inflammatory that heals and brightens. Sandalwood- Soothes and clears skin. Neem- tones, heals and clarifies the skin. My face craves this mask dolls. It’s that fabulous. No joke. Let me tell you about the the Mango and Lavender Body Scrub. OMG! It literally left my entire body glowing and silky smooth. Chris loved the way my body smelled and felt after using this body scrub. He couldn’t keep his hands and nose off of me lol. Lets be honest, we all want our skin to feel soft, supple and have that glow. In order to have that, we have to nourish our skin with products that have ingredients that are healthy and non toxic. Shaffali Skincare is just that product. I absolutely love Shaffali Skincare. Her products have taken my skincare regime to the next level. Her line not only nourishes your skin, it nourishes the soul. You can feel the love she has put into her lovely and soulful products. I am happy to announce that Shaffali is offering all you amazing dolls 20% off your order . Use my promo code: MYGLAMDAY! This offer will expire on August 31, 2018. Please tag me in your photos, I will repost your pictures in my stories. I know you will love these products as much as I do. Kat look no further Shaffali Beauty is organic, nontoxic beauty line i am so picky about my products I put on my body and skin. I know you will love! The best skincare ever. Cant live without! It truly is doll! So glad you love it too!! Definitely a must doll please comment what you choose. You make me want to try it! I will definitely have to give it a shot!! Esther clean beauty and Shaffali skincare is defiantly a must try! Please use the coupon code. Now I feel like I just need to try her products too! Sounds amazing! I am also a sucker for everything that contains turmeric ? They truly are doll use my code to get a discount. Wow this skin care line looks really high quality! Thanks for sharing! I love a great skincare product! I’ll like to try Shafali! Ohh these sound awesome!! I love to pamper my skin!! I do not post anything on my blog that I personally do not love, purchase or want to purchase! I love these products. I definitely need to give this a try. Thanks for sharing!!! Let me know what you purchase doll! Oh these products sound amazing, I need to check them out.